Big Rock Sports offers the largest and most successful trade shows in the industry. New products, new vendors, new ideas and the right product mix for each regional market draw more than 9,000 retailers and 900 manufacturers every year. Our shows give you unrivaled access to the leaders in the outdoor sporting goods industry. At Big Rock Shows, you have the opportunity meet and network with manufacturing reps, other retailers and representatives from Big Rock Sports. They will all be there, in one place, ready to answer your questions and discuss the latest industry information and trends. Big Rock Shows are your best buying opportunities each year, so be sure to take advantage. 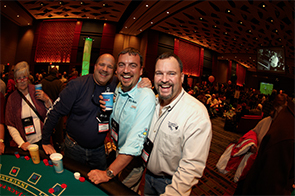 Every trade show offers exclusive pricing, friendly dating terms and show and attendance specials, including the always-popular Hot Profit Event. The real difference between a Big Rock Show and all others is how you can use it to help your business grow. We offer exclusive features, including business-building seminars on the latest topics such as social media marketing, effective in-store promotions and retail secrets from industry experts and professionals. We are constantly talking to our customers to see how their businesses are doing, and through these interviews you can learn about the latest retail trends, tips, marketing tactics and much more.